Update: Peter Leithart offered a sincere, compassionate statement today regarding his involvement in the Jamin Wight situation, which you can read here: goo.gl/wkrMas. I appreciate Leithart’s statement and hope it will encourage Sumpter, Wilson, and others to reconsider their current tactics and stances. I have accordingly changed several parts of this post that referred to Leithart. Toby J. Sumpter is the Pastor of Trinity Reformed Church in Moscow, Idaho. Trinity is the “sister church” to Doug Wilson’s Christ Church and is a member of the Communion of Reformed Evangelical Churches (which Wilson started and presides over). More relevantly, Trinity is the church that homeschool alumnus and convicted child molester Jamin C. Wight attended while he preyed on a 13-year-old homeschooled girl. One of the accusations leveled against our community has been our lack of care for the victims of abuse. And wound into that accusation is the assumption that instead of caring for children and victims, our refusal to cow to the accusatory catcalls is necessarily just an act of self defense, defending leaders and pastors instead of the vulnerable little ones. I’d like to begin with the nature of pastoring and spiritual healing. Like Jesus, the Great Physician, pastors are physicians who care for the souls of their people. Yesterday was the fourteenth anniversary of 9/11, and I caught a few minutes of footage and interviews from survivors last night on the news. The footage of the trade towers collapsing and the men and women running (one pushing a stroller) is pretty haunting to watch as the smoke and dust billows out and down the streets of New York City. Then there are the wounded walking with blood on their faces. I watched a reporter run up to one man and put a mic in his face and ask what happened. But as the rescue crews dig in looking for survivors and medical professionals come on the scene to give aid, one of the first things they do is start putting up the yellow tape. In order for the emergency crews to do their work they’ve got to create a safe and secure space for that care to take place. Pastors and elders are the emergency crews that frequently arrive on the scene moments after explosions. And when reporters show up and start accusing the rescue workers of harming people, it’s not helpful in the slightest. Maybe they even point to the wounded coming out of the rubble, they catch snippets of conversations on the radios, and then they set to their blogs reporting half truths and raising suspicions that the rescue crews are actually protecting the terrorists. Why are you protecting terrorists? Don’t you care about the victims?! Imagine you’re a fireman, a nurse, a police officer in that situation. Yes, of course it is important for there to be true accountability. Yes of course firemen and law enforcement and medical teams could use their positions to do harm. But you don’t actually provide any true accountability by stirring up an angry mob outside the yellow tape, and rarely do you even get a complete picture by shoving a microphone in the face of one bewildered survivor. And please don’t read into this metaphorical scene as though I’m assigning certain people certain parts. I’m not. I’m just painting a scene that generally corresponds to the kind of work pastors have to do. Sumpter makes clear with his last few sentences that he doesn’t want us to “read into” this scene he is painting. He’s not “assigning certain people certain parts.” “I’m not,” he insists. Except he is. He began his scene by saying that, “Pastors and elders are the emergency crews that frequently arrive on the scene moments after explosions.” Who are those emergency crews? They are “a fireman, a nurse, a police officer.” In “emergency situations,” then, pastors fill multiple roles: putting out fires, healing physical wounds, and punishing criminals. Sumpter is being entirely disingenuous, then, in pretending that he is “just painting a scene that generally corresponds to the kind of work pastors have to do.” He is clearly describing how he feels about the current controversies over Doug Wilson and Peter Leithart’s mishandling of Steven Sitler and Jamin C. Wight‘s crimes. In his mind, he and Wilson are just trying to care for the victims of a terrorist attack. As CREC pastors, they’re the only ones — in Sumpter’s scenario — who have the ability to put out fires, heal wounds, and punish criminals. Anyone else — including actual news reporters like Katie Botkin, actual survivors of those child molesters’ crimes like Natalie Rose Greenfield, the actual parents of those survivors like Gary Greenfield, people with actual child abuse prosecution experience like Boz Tchividjian, other pastors who provide actual training in child protection like Mike Sloan and Beth Hart, or survivor advocates like myself who create child abuse prevention curriculums for homeschooling families — are apparently just running around for no purpose other than to make false accusations. And we clearly have no idea what we’re doing because, no, only the CREC pastors know how to be firefighters, nurses, and police officers. There are different kinds of gifts, but the same Spirit distributes them. There are different kinds of service, but the same Lord. There are different kinds of working, but in all of them and in everyone it is the same God at work. Now to each one the manifestation of the Spirit is given for the common good. To one there is given through the Spirit a message of wisdom, to another a message of knowledge by means of the same Spirit, to another faith by the same Spirit, to another gifts of healing by that one Spirit, to another miraculous powers, to another prophecy, to another distinguishing between spirits, to another speaking in different kinds of tongues, and to still another the interpretation of tongues. All these are the work of one and the same Spirit, and he distributes them to each one, just as he determines. Just as a body, though one, has many parts, but all its many parts form one body, so it is with Christ… The body is not made up of one part but of many. God gave different gifts to different people. Not everyone is a foot in the body of Christ. Not everyone is a hand. It would lead to great confusion and pain in a body if a foot told a hand it had no purpose being a hand and that it, the foot, would take over hand duties. And then also took over ear duties. And eye duties. And mouth duties. In the same way, pastors have the role of teaching and mentoring individuals and families within their faith communities. Unless otherwise trained, pastors are not to usurp the duties and roles of other parts in the body of Christ. Pastors are not to usurp the duties and roles of a child abuse prosecutor. They are not to pretend they know how to be a counselor to an abuse survivor with PTSD. They are not to act as if they need not listen to the advice of a survivor advocate. Each of these individuals has a duty and role within the body of Christ and those duties and roles are distinct from the pastor’s role. In Sumpter’s analogy above, pastors should not play emergency crew. Pastors should play pastors. And they should step aside and let the emergency crew members do their jobs. And when they are later pastoring their churches, if questions about how to be a better pastor to those impacted by the emergency arise, they should give the floor and pass the microphone to those who actually know: the firefighter, the nurse, and the police; the child abuse prosecutor, the child abuse prevention teacher, and the professional survivor advocate. Stay within your field of expertise. Faithful shepherds imitate the Good Shepherd who lays His life down for the sheep. And they often lay their lives down by standing up to the paparazzi, to the reporters, and to the internet mobs that want to rip open the wounds that have healed, that are willing to risk further complications and secondary infections to satisfy their lust for knowledge and power, that want to diagnose your problems and offer you their home brew solutions from three thousand miles away. One astute observer replied to my last post pointing out that according to Tolkien, orcs were originally abused and tortured elves. And I have no doubt that some of our loudest, shrillest opponents truly are victims of great hurt and pain. And so I say to you, my friends, if you can hear me through the fray: Jesus our Savior bore our griefs and carried our sorrows. I have no doubt that some of our loudest, shrillest opponents truly are victims of great hurt and pain. And so I say to you, my friends, if you can hear me through the fray: Jesus our Savior bore our griefs and carried our sorrows. Hear him through what fray? Well, probably the fray of Sumpter calling them hags and orcs and trolls. So yes, I hope you can hear the true message of Jesus through Sumpter’s personal insults. I hope you can know the message of Jesus is actually one of love instead of the message of derision and ridicule that Sumpter models. And I hope that Sumpter one day realizes that if he really thinks his critics are “victims of great hurt and pain,” he should stop gleefully rubbing salt into their wounds. As a child, I absolutely loved Madeleine L’Engle’s Wrinkle in Time series. One the moments that has always stuck with me throughout my life was the “Naming” passage of the second novel, A Wind in the Door. In that passage, Echthroi — evil personifications of nihilism — try to “X,” or erase,” the protagonist Meg Murray. The Echthroi are overcome by the process of “Naming,” which L’Engle describes as re-integrating a character with its true, best self. 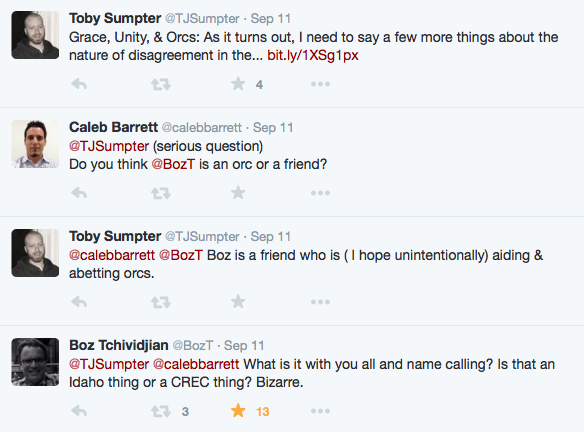 I would suggest that this is a better (and more Christlike) tactic for engaging people whom Sumpter finds “orcish.” If indeed they act out of great hurt and pain, then it would be more loving to speak to them as if they are not monsters, but human beings. Hurting human beings, yes, but human beings. People who are desperately trying to keep other people from being hurt like they were. If Jesus encountered such people, I believe he would Name them, not X them. I sincerely hope Sumpter, Wilson, and their communities can learn to do the same. And I think Peter Leithart today modeled how this can be done. A friend in Moscow asked me to let you know that Jamin would have been attending Christ Church when the abuse took place, and only well afterwards attended Trinity. Thanks. Toby Sumpter has a M.A.T.S. from Erskine Theological Seminary. In looking at the course requirements for this degree, there are no classes in counseling, child abuse, or domestic violence. Sumpter has absolutely no background or experience for how to victims of trauma and abuse. He should stick to what he knows – preaching and teaching theology. Thanks so much for this excellent analysis of Sumpter’s words. The arrogance of these guys boggles the mind. I have never met a pastor, in 50+ years of church membership, who thought as highly of himself as these guys do. I think that Wilson, Sumpter and other pastors like them are terrified of “pew peons” who think and question and speak, because their theology and need for control simply don’t have room for those people. I wish I hadn’t met such arrogant men but “it’s deja vu all over again.” Spend any time in one of these fake patriachical churches and you will. If only you knew these brave men in person. I would like to say that I am a Moscow local, and while I have not been privy to the details of these cases, I have been struck by the contrast between Sumpter’s responses and Wilson’s responses. Sumpter has said relatively little about this situation, and while I do think it would be more productive for him to focus on the rational commentators rather than the “mob”, I still have great respect for the tone he has used during this ordeal. Compared to the overwhelming arrogance and complex rhetoric of Wilson, Sumpter has been calm, rational, and compassionate in his posts on the matter. I disagree with his stance, but I respect his style. And Leithart’s response blew me away… I honestly didn’t expect such grace and humility from a CREC leader, but he has given me hope that change is on its way. All of this aside, thank you for your careful consideration of these men and this situation, and thank you for responding and disagreeing without name calling or demanding the death of these men. These conversations need to happen publicly, and it’s good to hear rational discussions on these subjects. That said, while the internet indeed is a poor medium for solving problems of living, resort thereto would be less nececessary if church courts weren’t blocked and sheep given the justice demaded for them in Scripture. How about it, Mr Leithart? The question that comes to mind – and I have lived through some of these ‘problems’ personally – is why in the world have we granted this kind of authority to church ‘leaders’? Most of us likely never give it any thought, until the need arises, as in, all of a sudden we discover that our elders believe that they have the ‘authority’ to ‘rule’ us. They believe they have the authority to ban us from the Lord’s table, for any reason whatsoever, and command us to undergo ‘discipline’ and then decide if, or when we are ‘allowed’ to return. How many of us ever thought such things happened in this day and age, until too late? I will tell you that it has happened repeatedly in my church over the last decade, and many have quietly asked ‘What in the world is that?’ but did not speak out loud. I would guess that perhaps the same is happening in other similar high-handed churches, and people are too ‘polite’, intimidated or brainwashed to demand that church ‘leaders’ answer to the body, rather than vice versa. Perhaps as we become aware that this is not a unique problem, more of us will begin to make noise, even if it means having to risk our church membership. This is not easy, particularly in more rural areas in which there are not many options, but it must be done if we want to put a stop to spiritual abuse and tyranny by church ‘leaders’ who have forgotten their call to servant leadership. We need to demand the sort of biblical leadership that the body of Christ deserves and that the Head of the church commands, rather than the absurd lording it over people rulership that is becoming increasingly common in Reformed circles.. I sure do remember what it is to be victimized by “Christians” which is why I now avoid organized groups of same. People are leaving groups and churches in droves, but still want to keep their beliefs. Pastors and ministers have too much of the wrong kind of power, and won’t live humbly, as servant leaders, yet they tell others they must serve the church, in some pretty strange ways. Intellectual wanna-bes who think references to orcs are clever. Because Tolkien. *eye roll* Could these guys be any more pretentious? It’s hardly the most egregious of their offenses, but I don’t need anything else, really, to know that they don’t display the humility required of men of God. Plain eng, it truly saddens me when the institutional ‘church’ does exactly what it was instituted to do – drive people away from the true God and His genuine, freely offered love. In simple terms – it’s a fake, an institution that serves those who struggle for power and control of others and their wealth. We get scripture twisted into corrupt, God-blaspheming doctrines that make Him the source of man’s own freely chosen evil and justify the power hungry hierarchy. It is only when we stop viewing the institutional ‘church’ as legitimate that we will stop being surprised that it seethes with a brood of vipers. That’s not to say this is true of all in the ‘church’, as many who genuinely seek God are deceived into thinking the ‘church’ is where they will find Him. It is these sincere, trusting folk that get taken advantage of by those with all manner of godless motives. I guess, like you, I am still peeling layers off of the onion, and I have no idea what, if anything will remain of the so-called ‘church’ when I am through; but I hope I never get so disgusted by the pretenders that I write off God instead of them. God is real, good, faithful, loving and everything that these false, self-serving hypocrites are not. I pray that you will someday discover Him in His true humility and holiness, rather than in the false garb of arrogant, judgmental hypocrisy that the pretenders display. It’s history repeating itself. Just as in the days leading up to Jesus death on the cross, the Jewish leaders were arrogant, power hungry men who were filled with spiritual pride. Jesus was the opposite; he came to heal, restore and serve. Jesus is the exact representation of God. I hope we can all see the distinction and never get God confused with this type of religion. The consistent theme from the pastors is that they are only interested in protecting the livelihoods. They aren’t interested in protecting the victims (past, present & future) if it comes at their expense in any manner: financial, social or political (within and without their church). I hadn’t read the message from Peter J. Leithart. He took responsibility for his role in what happened, including acknowledging that he was duped, that his conduct further harmed the victims and he apologized to the victims and asked for their forgiveness. That is what people are supposed to do, regardless of their religious beliefs (or lack of them). I don’t know whether he truly means what he wrote, but this one message puts those written by the other elders/pastors to shame. I doubt they’ll learn from what he wrote. I rather hope they don’t because all that would succeed in doing is teaching them how to further harm others. I prefer that they not hide their real intentions.